Yes, but you seem to be throwing the baby out with the bathwater. Some things are classified, so what? No idea about the rock. What's the source for that photo? Is it direct from NASA? Can't do much without such info and what am I meant to be looking at on the NASA link? I am no expert in photography but others on here are. But, before you can tell me NASA did this , more info is required - nullius in verba, remember? Hello? Can you show me a photo with a link to NASA that shows this? What is the source of your image? I can't even zoom in on that so you really have to up your game. A rotten spot on a apple will eventually ruin the whole fruit. Science is not an apple. Whatever your spot might be, it does not do away with the whole body of scientific knowledge. That is a rubbish analogy, if I may say so. Baby with bathwater, again. That is not the original image. That is a mosaic. Find the original then get back to us. That page tells you where the individual images are. That is very observant on your part, my friend. In as far as finding the original frame, well, that is going to take some doing. Each photo used has no identifier as to which photos were used, and which were left on the editing floor. The only thing they say is there were 33 photos used. A sweeping panorama combining 33 telephoto images into one Martian vista presents details of several types of terrain visible on Mount Sharp from a location along the route of NASA's Curiosity Mars rover. The rover's Mast Camera (Mastcam) recorded the component images with its right-eye camera on April 10, 2015, during the 952nd Martian day, or sol, of Curiosity's work on Mars, before that sol's drive. The panorama spans from south-southeast, at left, to west-southwest. The color has been approximately white-balanced to resemble how the scene would appear under daytime lighting conditions on Earth. 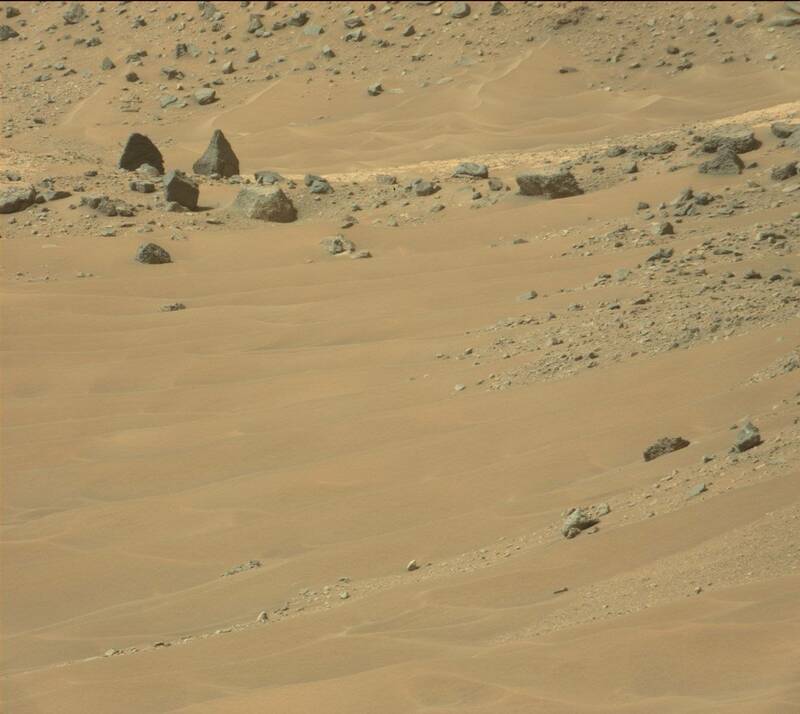 The photos were taken with Curiosities "Right" Mastcam, on April 10th, or 952 sol. Fair enough. 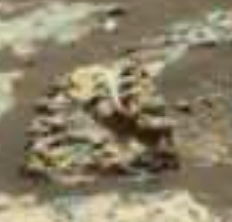 Go to Raw images for Sol 952, and there is this, except its one day apart April 11th. Raw images are stored by camera and Sol number. Given the time lag involved its understandable they are not or may not be received on the same day as created. There are 7 frames that are similar. No way to know which one was used in the mosaic. Yeah, those "critters" show up every once in a while. I think they're a result of that calcium that gets everywhere sinking into a hole and then getting exposed by erosion.